The YoyoFactory Wedge is one of the best, if not the best plastic yoyo that you can find on the market. It offers incredible performance for a price of about 20 dollars, literally the best bang for your buck. Firstly, let’s see the specs! The yoyo is made out of polished polycarbonate which gives it a crystal-like look. The Wedge really stands out from the rest of plastic yoyos for due to its unique boxy shape. It may not look so appealing first, but the performance will make you say “WOW!”. It can be said that YoyoFactory nails plastic yoyos, most of them are above the completion in terms of design and playability. 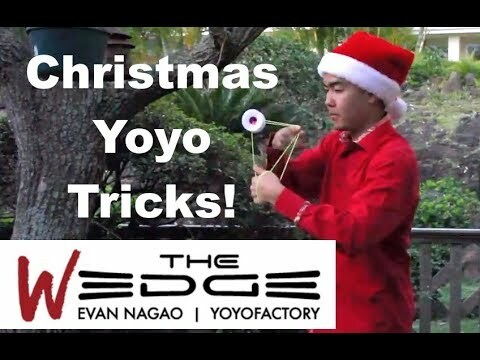 Evan Nagao, the 2018 yoyo champion took as reference his previous signature metal yoyo the YoyoFactory Edge when designing this plastic toy. The rims are extremely prominent and move the weight towards the edge of the yoyo(pun intended:)) ), thus creating an extreme weight distribution suited for the flashy tricks of Evan. The structure itself can handle pretty well powerful shocks when hit to the ground, so you don’t have to worry about making a few scratches. They won’t bother as much as for an aluminium yoyo(the metal yoyo scratches feel so uncomfortable!). Not to forget about the cup which is bead-blasted, a thing to be most appreciated for. The smoothness of the side cup improves the thumb grinds and fingerspins that will last for ages. When you open up the yoyo, you will see that the bearing seat is represented by an aluminium disk, different from the average bearing place directly moulded in the manufacturing process. As a result, the players can tighten up the bearing a little more between the two halves. However, you shouldn’t exaggerate in this regard, as not to break the yoyo. Next to the bearing seat, there is a red slim pad, the best one from YoyoFactory as it has an amazing response! This ensures tight binds for you after you are finished performing the tricks. The Centre Track bearing is almost silent when the yoyo sleeps. The yoyo has almost no vibe so that you can continue your tricks uninterrupted. The large catch zone helps you land the yoyo onto the string more easily, but it isn’t so large that when you have to hit the right string you accidentally touch more strings than intended. Due to its glossy surface, you can’t perform finger grinds as long you may want. It works.but not exceptional. The rim-weighted design gives you a powerful throw for a 67-gram yoyo and unmatched stability. In terms of spin time, it can be said that is impressive for a plastic yoyo to continue spinning for around 1 or 2 minutes. This way, your tech combos can continue for ages. The horizontal tricks on this humble yoyo (at first sight) are simply outstanding. What can be better than that? The shiny polycarbonate surface-may create problems for finger grinds. The YoyoFactory Wedge still remains an amazing plastic yoyo to play with. I really recommend you to buy it and try it. You won’t regret any dollar spent on it! The overall design may be boxy, but it does its job of ensuring a stable and long spin. In my opinion, the cons showed previously are a bit stretched up, so you don’t need to worry about them! Tell me what you think about this yoyo and if you have any questions or ideas, type them into the comments section! Have fun yoyoing!